Western North Carolina's premier Gated Community for Mountain Views and Creek-Front Homesites. What was once a thriving center for magnetic ore mines, and was even named Magnetic City at one time, is now the breathtaking community of Buladean, home of Beech Creek. In its early days, Buladean's ministers were known as "circuit riders" and used horses to take them over the rough mountain paths. After a few of the main roads were opened, and the supply of ore depleted, residents of this small village turned to the forest for their livelihood, filling the fledgling roads with wagons carrying timber. Many purchased properties and settled in this picturesque mountain community. Today, visitors and residents find much of the charm and natural beauty that marked Buladean's humble beginnings remain a comforting part of everyday life; a life that cherishes the simplicity of the past to enrich the present. These North Carolina mountain properties are dotted with charming mountain homes. Beech Creek remains lush with scenic, mountain property. Mind you, this gated community, Beech Creek, is no ordinary mountain property. 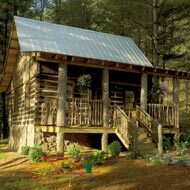 It is situated in some on some of the most coveted North Carolina mountain real estate. If you think mountain communities lack modern day contemporary amenities, you need to know that Beech Creek residents are modern families who have opted to live in a serene place without abnegating any of their modern gadgets. © Beech Creek Gated Mountian Community Properties in North Carolina.